Modern enterprises recognize that AI is becoming critical for business profitability but many are unsure on how to deploy a solution – should they buy, build, repurpose, or outsource? 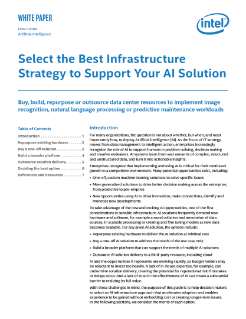 The array of choices available can be overwhelming, but this guide will explain how best to approach AI deployment given your specific IT infrastructure and business priorities. For many of the organizations we speak... to, the question is not about whether, but when, and most importantly how, to deploy Artificial Intelligence (AI).